New York Vehicle registration time again already? If it's that time of year you'll want to make your way to the New York DMV and be sure to register your vehicle before your NY tags expire. Don't want to wait in line at the NY DMV? Not a problem. Many state DMV websites allow your to renew your registration online and skip the dreaded DMV lines. For: passenger vehicles, small commercial vehicles, light-duty trailers, motorcycles, and ATVs. You can order Empire Gold plates for most registration types when you renew. See the FAQs about the new Empire gold plates. 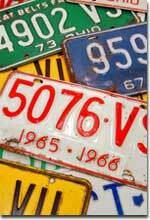 Replace a vehicle registration certificate/sticker that is lost or damaged. Order Empire Gold plates for your vehicle at a time your vehicle is not due for renewal. See the FAQs about the new Empire gold plates. Complete an application on-line and save time when you apply for a vehicle registration at a DMV office. EZ-Visit can only be used for registration of a vehicle purchased in a private sale.